For the second week in a row, a surprise former Deadstein lead guitar player, came into Studio B to join the band of freak. Last week it was Larry Brent, and this week we were fortunate to be accompanied by Andy Trister. He missed the first two songs, but was a major presence in our music through halfway through the second set. That was good to see, because Andy usually bolts after set 1 and his talents were definitely appreciated during the Eyes, Estimated He’s Gone that he stuck around for during the second set. In a weak attempt to keep Andy playing, Rich rushed into a Hard to Handle out of the He’s Gone, but it wasn’t enough to entice Andy to stay. As a matter of fact, I assume that encouraged him to leave quicker than he would have otherwise. When Andy pulls off a successful He’s Gone, then He’s really gone for good and nothing’s gonna bring him back> He’s gone was a good launching point for Andy as it was really good. I really liked the sound and feel of the He’s Gone as it was nice and relaxed, much like the Oh Babe It Ain’t No Lie for the first set. I was lucky enough to have an extra microphone and channel in order to capture Andy’s music and the recording are really enjoyable to listen to. Andy was really instrumental in getting us through a Hell In a Bucket which we really need him to provide those great melodic runs for. I am glad we decided to perform that one while he was there as I know I cannot carry the lead obligations on that rocker. The Mexicali was probably the weak point of the Trister songs, due to no fault of his. Too bad, because the song started well, but by the 2nd lead, it was in free-fall and not much fun to participate in. The Music Never Stopped to close the first set was a nice way to cap such a good set. The end of the night tailed off as they usually do, leaving us to flounder playing a couple of Beatles songs, that we have no right to play, to close the night. In any case it is still a fun endeavor to try and when you fail, there is not reason to freak out, The only real time to freak out is at the end of a posting, so this Freak is out. Our guest surprise for the night was Andy Trister, who would of thunk it? Rich kept this one close to his vest and we were able to enjoy the tones and the notes of Andy through the first set. In addition to the song you see, we also played the following songs; Love in the Afternoon, Cumberland Blues and Standing on the Moon. Unfortunately, Rich’s tape full recorder system only worked through the end of the first set. We totally missed those 3 songs and beginning with the Abbey Road Medley we were only able to capture the stereo room recording. Nevertheless, the first set recording was great and what else we did captured was good to get. Who knows what we’ll get in the future. Freak Out. I decided to work on a Built To Last during the week, I grew tired of always declining to play it, claiming I couldn’t do it, so I grabbed the song by the horns and learned it. During my listening to it, I remembered Jerry would often use his MIDI trumpet sounds during, so I decided to emulated Jerry. I took out my Roland-ready MIDI guitar setup out of storage in my basement, changed strings and practiced and with it on the Built To Last. I incorporated all the MIDI equipment in my gig-bag and I was ready to go. Below is a link to an article discussing MIDI turning 30 this past January. We were in the big room in Carroll’s and when I got there I got Jules to get me a Roland keyboard amp, this coupled with my Fuchs Twin Reverb, I was wired and ready to go. With all this craps at my right foot, I decided to place Donna to my left, which Kevin mocked me for, but it did work out well for me during the jam. Just as we were about to embark on the evening and begin the Feel Like a Stranger in came the big surprise for the night, Andy Trister. We almost waited for him to begin, which delayed us a good 20 minutes or so. Delay-Schlemay, the Stranger really smoked. The serendipity of Trister showing up and me having my MIDI setup was a big bonus for the night since it meant I would play more organ sounds and no interfere with both Andy and Alan on the guitar sounds. I guess I can spew out the canned cheese for one night and not only not get to bored by it, but enjoy the mix. There were moments during the What a Wonderful World and the Midnight Moonlight where I felt the MIDI keyboard sounds were right on. After the Feel Like a Stranger opener I decided to modify the planned setlist a bit to accommodate Trister’s unanticipated presence and some potential synergies with Donna. I therefore threw an I Shall be Released gauntlet for Trister to sing leads on. When Donna came in on the background vocals on that it proved to be pretty special and that GarBand stuff really works with her. Donna and I also continue to work on some of our Bob/Donna duets and they showed some nice improvements including the Passenger and Beat It On Down the Line. We also tried to work on a Looks Like Rain during a min-break but the whole band ended up joining in by the end of the song. Donna had to leave by around 10:30 and Andy by around 11:00. Our close with Andy included an excellent What a Wonderful World and Midnight Moonlight. It was a really good Trister set. After another little break we started the final part of the night. I wanted to play some of the songs we skipped in the planned first set. We did the Next Time You See Me and I got to do the Built to Last. It was pretty good, but that late in the night, the focusability of my eyes on the fine print of that song is questionable. I kept it together. We then tries to accomplish Saint Stephen into Hard to Handle and we had issues but we also showed some promise. I think our Stephen has improved quite a bit. With about 5 minutes before the 12 o’clock quitting time, we decided to go big and long with a Terrapin. I thought it had a good groove and we executed it well with the exception of the major collapse in the middle. It was a great way to end a great evening. Oops, almost forgot, Steve was our only guest for the night. To listen to what we did, go to the files below. 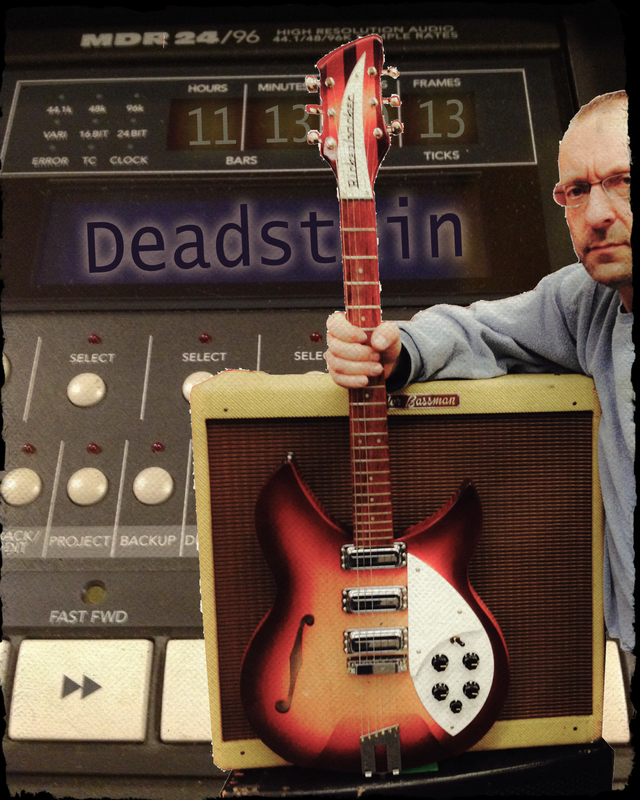 This week in jamming featured Andy Trister in addition to the usual bunch of freaks that don the instruments of Deadstein. While he was only there for the first set of the evening, Andy’s set was substantial and a good time for all.We had some really good songs in there like the To Lay Me Down, Jed, Comes a Time and more. I think our only guest were Meg Ryan and Donna D with Lee graciously giving up the throne for Ryan during the Bertha. Being the jam prior to Thanksgiving, we were all just thankful we could jam at all so this jam was one to appreciate. 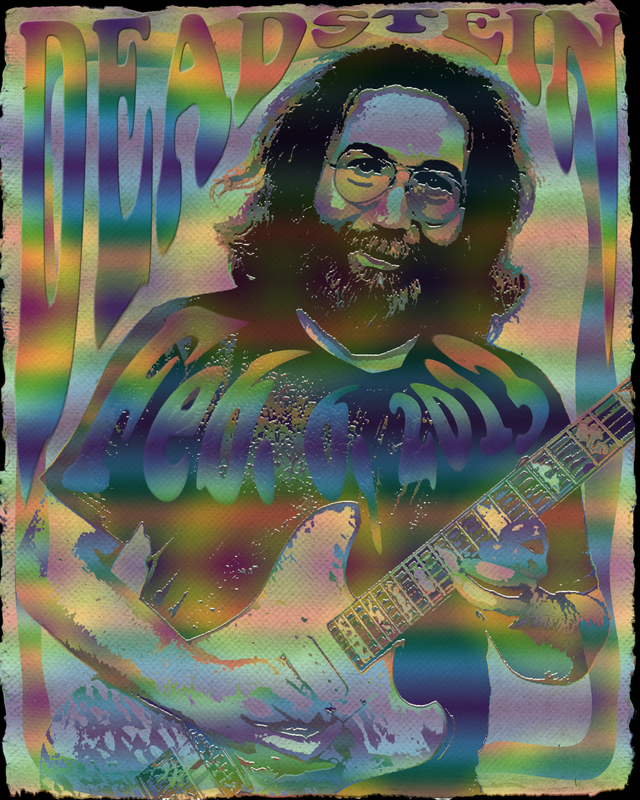 Wow what a big month of July and what a big night to end it all, just in time to commemorate what would have been Jerry’s 70th birthday. First let me talk a little about this prolific month of July we just finished. If you count up the songs, we played 112 songs in the 5 jams in July 2012, by far, this has to be a record. We have a “take no prisoners” attitude these days, leaving nothing on the table or at least trying to get our monies worth. 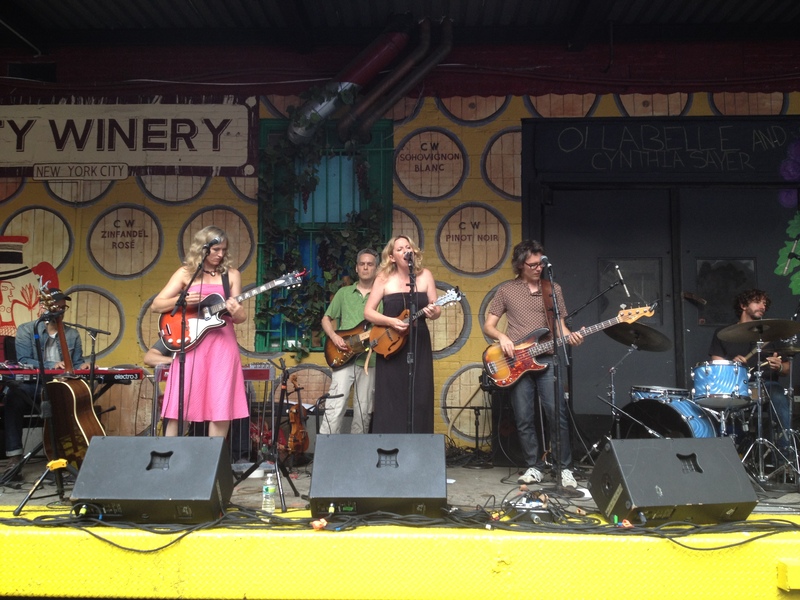 The reason we chose to play on this Tuesday night instead on Jerry’s birthday on the next night was the fact that Ollablle was playing a free one-hour concert at the City Winery between 6:30 and 7:30. Perfect timing to enjoy a super-dooper cool scene filled with free phenomenal music and then take a nice easy 60-block or so trip up to Deadstein. First of all I must mention that Ollabelle has such a great positive vibe and you couple that with the same vibe provided by the City Winery and the weather and you have the makings of a perfect evening. They played an hour, there was a great crowd with lots of friends, taping, close viewing and just great music. I suggest you check out Scott’, Rich’s or my videos. What an up-lifting experience to get you psyched to play your own music. After the Ollablle show I drove Rich and Scott up to the jam, enabling Scott to leave his car at home. By the time we got there just minutes after 8:00 o’clock, everyone was there waiting to play, including Andy Trister who accompanied us for the first half of the night during one of his all too infrequent jams with us. We played some great music during this set. For some reason I guess like to start jams with Trister on an Uncle John’s Band, I think I hope it is at a tempo and energy level that gets us underway in a controlled manner considering we have 3 guitars in the room. Out of the Uncle John’s I tried to segue us into a Hey Pocky Way, but the train wasn’t going to that town. It was bee-lining to Aiko-Aikoville and we ended up there, which wasn’t a bad thing. As we forged through the first set most of the stuff was good and a lot of fun. I don’ think Andy wanted to leave, but a full night with him just isn’t in the cards. We formulated a nice 12-song first set with lots of good moments. I gave Stagger the Same Thing he asked for, a first for him with us. We tried the Bucket once again, but this time with Andy, it gave it a lot more legitimacy. After that the rest of the first set just kept getting better and better. 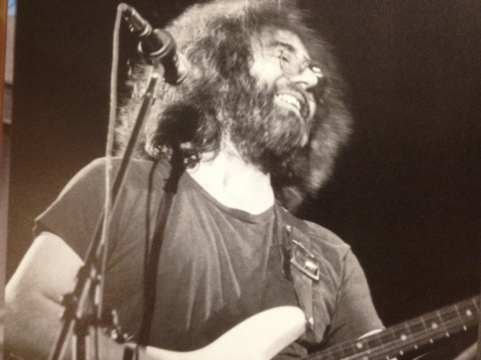 With Andy gone for the second set, we decided to get back to business and focus on Jerry’s 70th birthday. This was not until we played the I Shall be Released which we saw Ollabelle play a few hours earlier, which we have never seen them play before. They did it a lot better than we. Out of the Terrapin I entered into the Stephen without the standard intro, I thought that would get us going, and it helped, but we struggled a bit. We don’t do the Stephen enough. Our 12 o’clock quitting time reared its ugly head at the end of the Going Down the Road but that meant we were into August 1. This meant it was the big guy’s birthday, so we stayed a little later to play one additional Black Muddy River in honor of Jerry. This was 21st song capper on a long and great night, so I thought. Since I drove Scott and Rich uptown from Ollabelle, I decided to give them a lift home, downtown, and take the Holland Tunnel home myself. We all walked to my Honda Fit parked in Scott’s secret spot on 54th street and I hit the button on my key-fab to open the trunk, but it didn’t unlock. I don’t think there is even a key hole on my trunk to manually open the truck. I used the key to enter the driver’s side and to my dismay, the car was deader than we were. Lee drove around the block to go home and saw us standing there and had jumper cables, so we tried jumping the car, but we are 4-Jews and I guess car maintenance is not in our DNA. We couldn’t get it jumped and Lee almost shocked himself to death in the process. I’m sure we did something wrong. Scott then whipped out his AAA Card and a service call from a 54th street station was dispatched. It probably took them a half hour to get there and 5 minutes to jump the car. Just after 1am, I was driving Rich and Scott downtown as my alternator was charging my battery. I was praying I didn’t stall my car out, which I didn’t. After some bad maneuvering to get out of Scott’s neighborhood to the Holland Tunnel coupled with some tunnel traffic meant I wasn’t in NJ until just before 2am and didn’t get home until around 2:45. I long happy ending to a great night, that’s what she said. When life looks like easy street there is danger at your door. This Monday night jam was like the tale of 2 jams, and both tales were good stories. 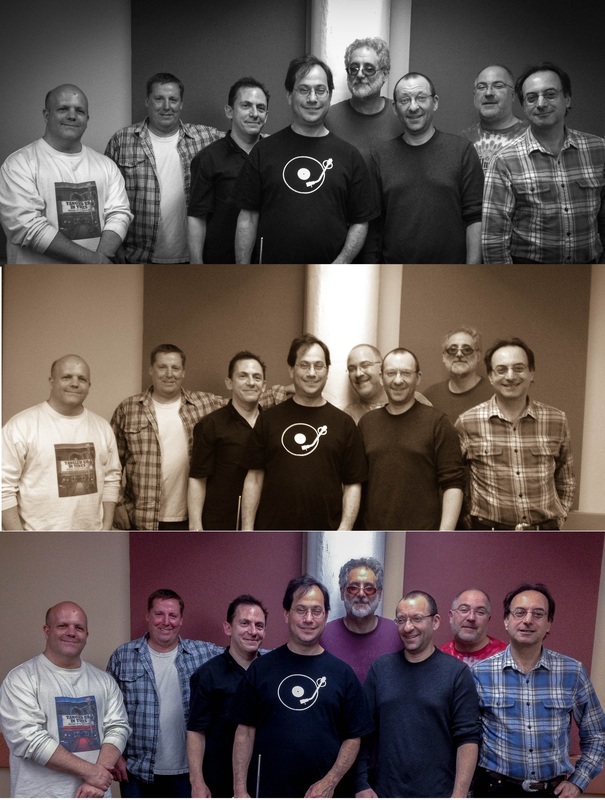 This week we were scheduled to have everyone back in the studio with the addition of Andy Trister for the first set. For the second set we jumped right in and played a pretty second setty type of first set. I think we were on for the most part and had a very good jam with Andy. While writing this about a week after the jam I do not recall too much about the night except the Music Never Stopped was a killer version and a great way to end our set with Andy. The typical Brokedown to end his segment of the night was all he wrote and he was out of there.We took a little break and and embarked upon our much different feeling and sounding second set. Before we get into it, we only had Stevie as a guest for the night, leaving his entourage behind to miss out of the goodness they we provided. Scott Bayer also showed up for the end of the second set. Lee asked for a little playing of the Truckin’ style jamming for the second set and that got us going down a road that led us to a hot second set and a complete evening of music. The Truckin’, He’s Gone, Other One was a very natural feeling lineup but the surprise trip into the Dark Star was probably a stunner to most and was the first Dark Star we have played with Lee drumming with us. This led us into some other surprising choices including the Death Don’t Have No Mercy and quick Me and My Uncle and back into the Other One. The transitions were so fast during this part of the night, no one had a chance to complain about the Me and My Uncle. Whart Rat and Sugar Magnolia were fitting closers to the set that provided us the energy to finish strong. Even the encore of Werewolves of London felt good. While the entire night had a bifurcated feel to it, the entirety of it all was a complete feeling of satisfaction that drive you to showing up once more time. Can’t wait to do it oe more time and freak out. If you want to hear the music from last week feel free to click on links to the MP3s uploaded by Rich. 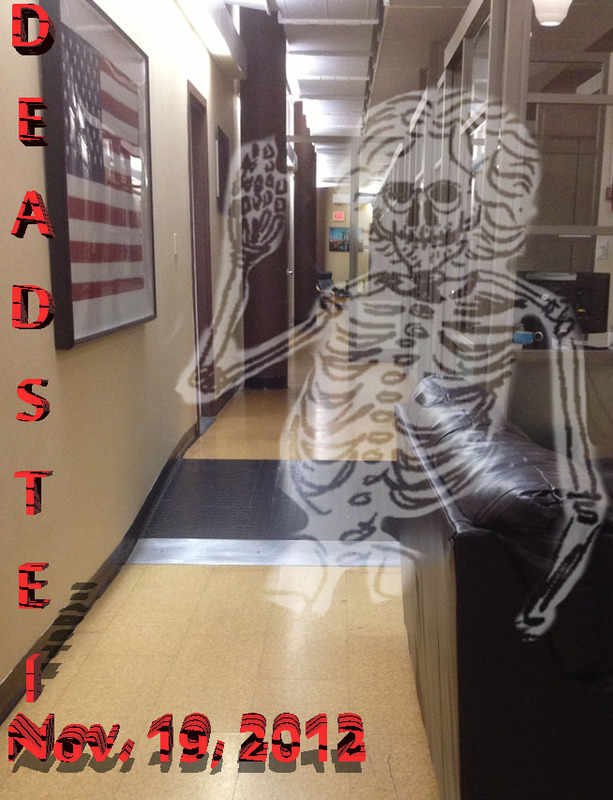 Another crazy night of Deadstein is what we encountered on this March 21, 2012. For the second week in a row, Stagger Lee joined us and Scott to give us a two-man rhythm section. This redundancy proved to be quite fortuitous later on in the evening. For the first set we also had Andy Trister playing lead guitar which always bring the level of music up a notch or two. A lucky man, he walked away with the final available version of the Jerry Garcia Song Book, version 8, with the bonus supplement. In addition Lee and Andy, we had Howie Weiner in the studio to hangout. Howie and I were discussing 1987 Grateful Dead which he is planning on making the theme of his next book. There are so many great memories from that time period. Stevie and Lindsey, who made it through almost the entire jam with us, are becoming regulars to our scene much like Steve and Edie on the Andy Williams show. Finally, we had the headache man himself in the room, Scott Bayer with his bongos. While annoying, by the time he was playing them later in the evening, I didn’t care. The music was marginal I think for the first set and for some part, I am going to blame it on the Rand-O-Matic. While it concurred with Andy’s request to open with a Getatway, the selection of a Bucket as the second songs sent us down a pathway of difficult massive mushiness which became difficult to wade through. Nevertheless, we made not even close to the best of it, and marched on. A song like a Bucket is a great challenge, especially early on and right out of a Getaway. It requires precision, which Deadstein possesses like Trister’s nearly 50-year old eyes. If nothing else, there probably were not too many other people sloshing their way through a Hell in a Bucket on March 21, 2012 like we were. In that, you have to derive some comfort. We had some sound issues through the night. The PA never had the bang it needed and hearing vocals and Rich’s piano was difficult. Kevin’s bass, guitar amp split combo was failing him on the guitar amp portion as that was buzzing and distorting throughout the entire night. All the guitars and drums seemed normal though. The Bucket’s jammed droned on in thick boring mode that was carried on in several songs in the first set. We eventually played and Victim or the Crime into a Hard to Handle that had the same characteristics and even the Here Come Sunshine had the same feel. This is why I blame the Rand-O-Matic a bit, but now that I think of it; the Rand-O-Matic only selected the Bucket. I was the buffoon that selected the Victim, Hard to Handle. Someone else called for the Here Comes Sunshine. As negative as I may seem, I bet the tape proves me wrong, because the music came forth for the most part and it was valid. I guess that’s the best I can come up with, “valid,” which isn’t too good. But as I said before, who else pulled a Victim –>Hard to Handle out of their asses on this night? No one! We took the long obligatory set break chatted, had fun. We lost Howie, Trister and Scott and gained Scott Bayer. Who made this trade the Mets? The second set we were going into with Lee solo on drums. I let him call the songs and that certainly helps a lot and we had a good second set. Brothers and Sisters we are pretty familiar with and the Halfstep is a challenge at that late hour but we did it justice. Lee called for the Eyes at 11:20 and here’s where his youthful energy, though he is technically 1 year older than Scott, invigorated us through a long song like Eyes and the inevitable loss of momentum never really materialized. The redundancy of the dual drummer has some great benefits for Deadstein and I look forward to it developing. When I think of Lee drumming, I think of him playing clay bongos on a Not Fade Away. I went into the Not Fade from Eyes to close the night. 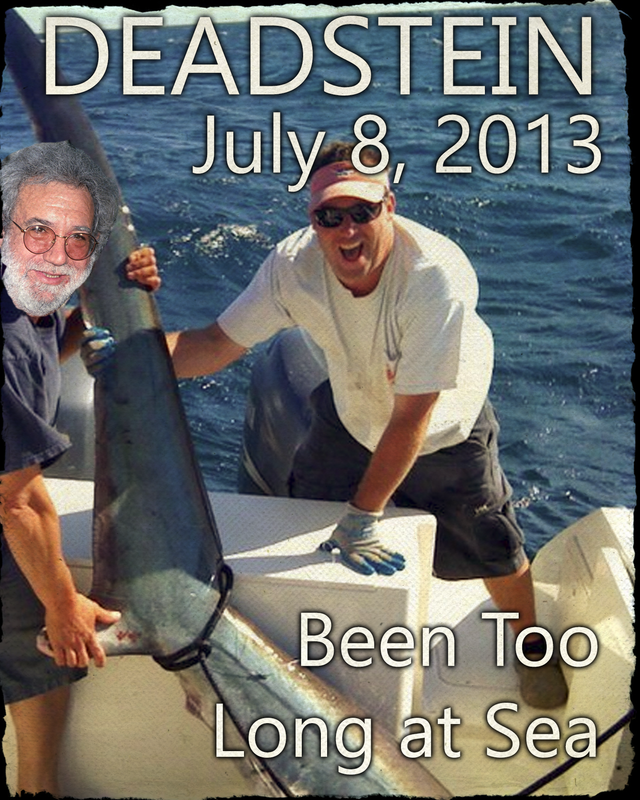 It turned out to be a big, fun, crazy wacky, topsie, turvie night of Deadstein. I can’t wait to do it again. For next week’s jam, I think I am going to get a set list prepared and send it out to everyone so anyone who cares to can prepare for the night’s music. I think this will help. It will at least help me. Freak out people and get prepared for next week.